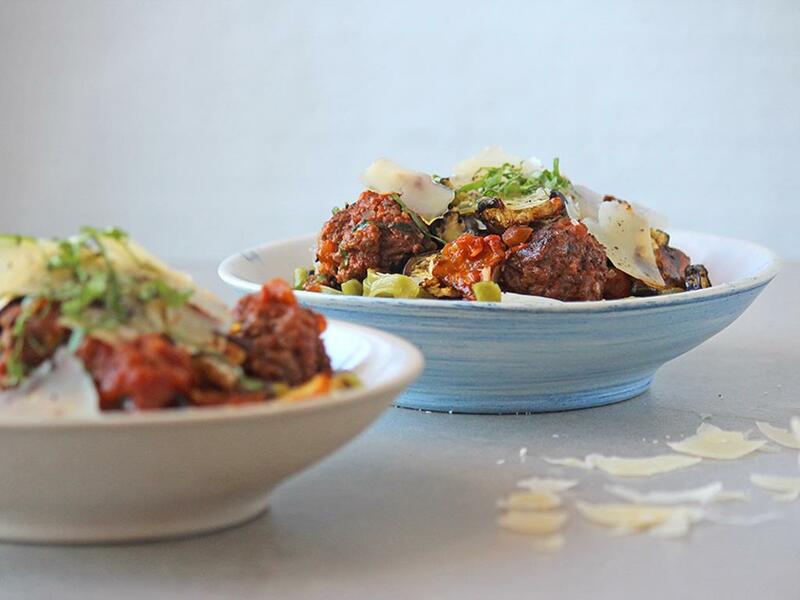 Roast aubergine, meatballs & spinach tagliatelle with a mixed herb infused tomato sauce. Meatballs: Mix together the beef mince, HALF the garlic, HALF the onion and HALF the mixed herbs. Season generously with salt and pepper and shape the mixture into golf ball sized meatballs. Add a drizzle of olive oil to a pan on medium-high heat. When hot, add the meatballs and brown for 3 minutes, until golden. Move them around in the pan to make sure they brown evenly. Remove from the pan and discard some of the liquid (if too much). Set aside. Tomato sauce: Using the same pan on medium-high heat, add the REST of the onion with a pinch of salt and sauté for 5 minutes. Add the REST of the garlic, the REST of the mixed herbs, grated tomatoes (with the liquid) and cook for 2 minutes, before pouring in the passata and water (½ cup for 4; ¼ cup for 2). Add the meatballs, season with salt and pepper then simmer (gently boil) for 10 minutes until the sauce thickens. Slice the basil leaves thinly and mix through. Spinach tagliatelle: Place a pot on medium-high heat and add the boiling water. When the water is at a rolling boil, add the tagliatelle and cook for 5 minutes. You want it al dente, which is slightly chewy and translucent. Drain and drizzle with a little olive oil to keep it from sticking together. Add to the sauce and mix through. Serve the saucy tagliatelle topped with the hard cheese and serve the roast aubergine on the side.